On March 14, 2019, New York City Mayor Bill de Blasio released the findings of a study that determined the City’s comprehensive strategy for the Lower Manhattan Coastal Resiliency (LMCR) project. The study evaluated dozens of adaptation measures and identified a set of strategies to build resilience in Lower Manhattan. Mayor Bill de Blasio announcing the findings behind their comprehensive strategy. The recommendations include developing a plan to extend the Manhattan shoreline into the East River to protect the low-lying and highly constrained Seaport and Financial District area. “As Manhattan’s prow, The Battery has long led the city into the future. In touch with the ocean every day, this park is among the most immediate places in New York to experience sea-level rise. The Battery Conservancy looks forward to working with Lower Manhattan’s residents and businesses and the many agencies of the City of New York — especially our partner, the NYC Parks Department — along with our neighbors at Battery Park City Authority and National Park Service, to develop and implement a truly holistic plan for water resiliency in Lower Manhattan,” said Warrie Price, President and Founder of Battery Conservancy. In addition, the city will advance $500 million for four capital projects to reinforce Lower Manhattan’s coastal areas and provide interim flood protections for the Seaport, parts of the Financial District and Two Bridges neighborhoods, to begin construction between 2019 and 2021. Since Hurricane Sandy, the City has worked to assess the impacts and risks of climate change and analyze coastal protection options along the 3.3 miles of shoreline comprising Lower Manhattan. The Resilience Study projects that by the 2050s, 37 percent of properties in Lower Manhattan will be at risk from storm surge. By 2100, with over 6 feet of projected sea level rise, almost 50 percent of properties will be at risk from surge, and 20 percent of Lower Manhattan streets will be exposed to daily tidal inundation. Groundwater table rise is projected to put 7 percent of buildings at risk of destabilization and expose 39 percent of streets with underground utilities to corrosion and water infiltration. “In the seven years since the devastation of Superstorm Sandy, Lower Manhattan is stronger than ever. But its vibrancy and economic vitality should not be taken for granted. The Lower Manhattan Coastal Resiliency Study makes it clear that climate risks require action to safeguard downtown’s status as a center of global commerce and culture. We look forward to working with the City and community stakeholders on short and long term solutions to protect Lower Manhattan and the growing number of downtown workers, residents, and visitors,” said John H. Banks, President, The Real Estate Board of New York. The Study examined a range of options for protecting all of Lower Manhattan, including the Seaport and the Financial District. These areas present unique challenges, including low-lying topography, a lack of available space, dense infrastructure above and below ground, and an active waterfront. The proximity of the FDR, Battery Tunnel and A/C subway tunnels further constrain the sites. Taken together, these elements mean that more traditional on-land flood protection measures are not feasible. Ultimately, the Study found that extending the shoreline into the East River is the only feasible way to protect these vulnerable and vital parts of the city. The shoreline may be extended by a maximum of 500 feet, or two full city blocks. This will create a new piece of land with high points at or above 20 feet from current sea-level. The new shoreline will act as a flood barrier during storms and protect the neighborhoods against projected sea-level rise. The exact extent of the new shoreline, along with the design and construction of this innovative flood protection system, will be determined through an extensive public engagement process. Over the next two years, ORR and NYCEDC will complete a Financial District and Seaport Climate Resilience Master Plan, which will include a comprehensive design for the shoreline extension and establish a new public-benefit corporation to finance, construct, and manage it. To begin this process, the City will immediately procure a team of engineers and designers through a Request for Qualification RFQ later this month. The Master Planning Process will be complete in 2021 and will identify a first phase project. 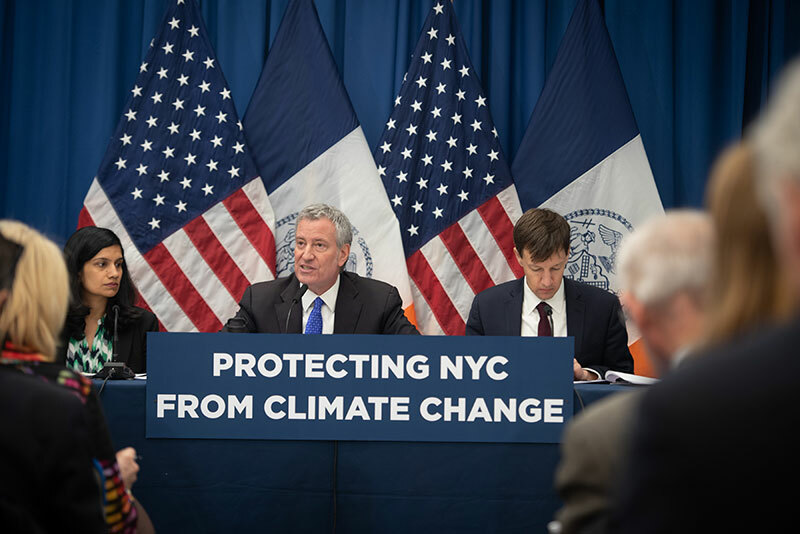 In response to these risks, the City is advancing approximately $500 million worth of investments in climate resilience as part of an overall strategy that includes both capital projects and additional planning for increasing the resilience of Lower Manhattan. In the South Street Seaport area, parts of the Financial District and Two Bridges neighborhoods, Emergency Management (EM) will spend $3.5 million to deploy a combination of just-in-time Tiger Dams and pre-deployed HESCO barriers by the 2019 hurricane season as temporary measures in advance of a permanent solution. In Battery Park City, the Battery Park City Authority (BPCA), with $134 million in bonds, will reconstruct its esplanade and open space to adapt to new climate conditions. BPCA kicked off design in 2018 and will start construction in 2020. In The Battery, NYCEDC, in partnership with NYC Parks, BPCA and the Battery Conservancy, will invest $165 million to elevate the wharf and esplanade and integrate a protective barrier such as a berm at the back of the park. This design will preserve the look and feel of the existing park while strengthening the shoreline. Construction will begin in 2021. In the Two Bridges neighborhood, NYCEDC is designing an integrated flood protection system comprised of permanent barriers and deployable or ‘flip up’ protections that will protect view corridors and public access. DDC will manage construction of the $200 million investment, which will begin in 2021. Beginning in the Spring, the City will establish a robust community engagement process to discuss the study, its strategies, dedicated investments, and further planning. Dedicated community outreach programs will take place for each of the advancing capital projects as well as for the Financial District and Seaport Climate Resilience Master Plan. “As we approach the seventh anniversary of Superstorm Sandy, we are encouraged to see progress towards a comprehensive resiliency infrastructure plan for Lower Manhattan and we look forward to a robust community engagement process,” said Anthony Notaro, Jr. Chair, Manhattan Community Board 1. Community engagement for the Master Planning Process will inform the extent of the shoreline extension and topside programming and identify a first phase project. As part of ongoing citywide efforts to increase the resiliency of City buildings and infrastructure to the impacts of climate change, the City also released the third version of its Climate Resiliency Design Guidelines. Since New York City facilities built today will remain in use for many decades to come, it’s critically important that they be designed to withstand the long-term impacts of climate change based on the best available science. These publicly available guidelines, which are recommended for use in municipal capital projects, equip engineers, architects, and planners with the tools and information they need to integrate future climate data into their designs. These guidelines were developed using local climate change projections that have been collected and refined over 10 years by the New York City Panel on Climate Change (NPCC). Using the Guidelines helps protect the built environment and the services New Yorkers rely upon, while avoiding future damages and higher operational costs. “New York continues to set global best practice in planning for coastal resiliency by finishing the final segment of the Lower Manhattan waterfront. As one of the most vulnerable cities in the world to sea level rise, New York needs to take proactive steps to address the impacts of climate change. We can be confident that New Yorkers – many of whom rely on this part of the city not only for jobs but also for transport – will be better prepared for generations to come. Cities around the world will be keen to learn from the experience of New York, and mayors across the C40 network will be watching closely at the success of this project,” said David Miller, Regional Director of C40, North America and C40 Ambassador for Inclusive Climate Action. See the Lower Manhattan Climate Resilience Study findings.